Love, Actually: Snowman Date: Just Add Snow! 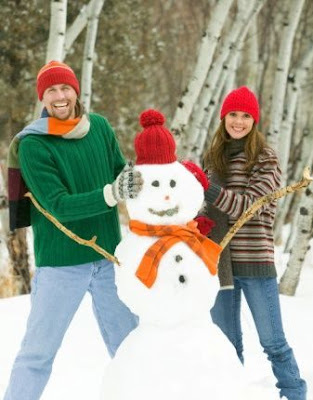 Snowman Date: Just Add Snow! Sometimes, when I just suggest doing something together, I get the "nahh...". But, when I make it a surprise date or put a little twist to it he'll see that I've put work into planning a date and he wouldn't dream of saying "nahh..." So, even though it's not on the top of his list of fun things to do, he'll do it with me....and then he actually ends up having a fun time. That's my trick. Nothing grandiose, but it works for me everytime! Put them all in a box with a bow on it (or wrapped)and inside have a note which says, "Just Add Snow"
Dress up in your warm winter attire (try to look cute...this could turn into a snowball fight...and proceed to a snow wrestling match...followed by, well, use your imagination). Gather all of his winter attire, too, so it's ready to go. and then just when your toes are about to fall off.... head inside for some hot cocoa! Build "Snow lovers" – If you have a secluded back yard, gather your lingerie and boxers to dress up down your snow lovers. Then you can watch them melt into one big puddle of love! Come on back on Wednesday for some romantic hot cocoa ideas to complete this date!! If it ever snows here I will be doing this. That's a cute idea-hopefully we'll get some snow soon! Cute idea. I love it. Weird question, but how would you get the boxers onto the snowman?